Today, the United States enters day 26 of a partial government shutdown as the president continues to demand funding for a cruel and xenophobic immigration agenda. Each day the shutdown goes on, thousands more feel the negative and unnecessary effects of the president’s unreasonable demands. Congress is debating how much, if any, funding to provide for additional walls, detention beds, and immigration enforcement agents. 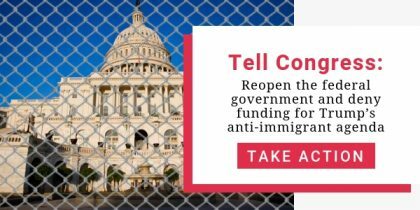 There can be no congressional compromise that includes funding to support an anti-immigrant agenda. The Unitarian Universalist Service Committee is asking UUs and our fellow citizens across the US to take three minutes to urge Congress to responsibly reopen the federal government and deny increased funding for detention, deportation, and border militarization. As people of faith and conscience, Unitarian Universalists must remind our leaders to keep their hearts open to all who are harmed by President Trump’s policies. All people have the right to seek safety and the right to asylum is protected under both U.S. and international law. Call your legislators today and tell them they must work to reopen the government without endangering any members of our shared community. Please tell the president to grow up and act like he really cares for All Americans not just his base.